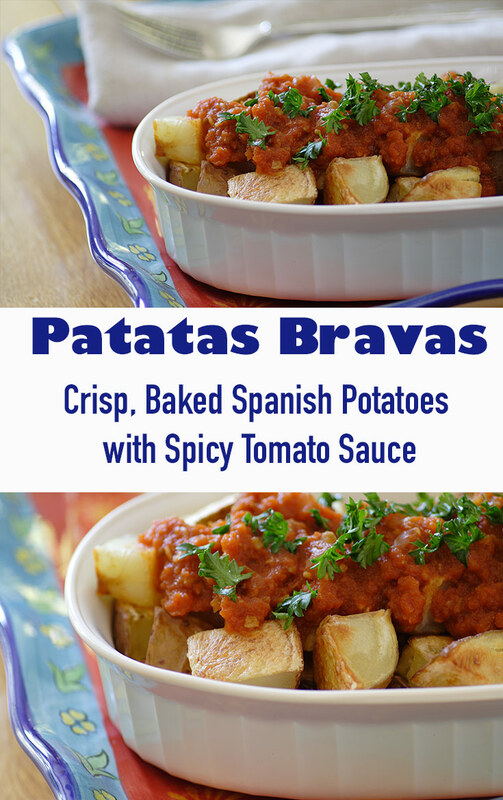 I was looking through a copy of one of those photo-filled, generic cookbooks that’s put out by magazines like Family Circle, and a recipe for Patatas Bravas caught my eye because it sounded good and I had all the ingredients at hand. 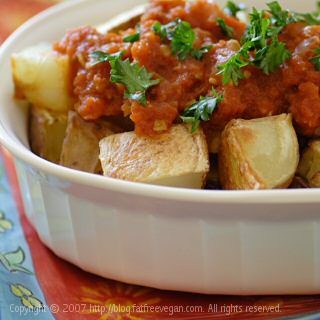 All I had to do was swap the fried potatoes with baked ones–eliminating a lot of olive oil and fat grams–and tweak the sauce a little, and I had a delicious but healthy tapas or side dish. The “Bravas” of the title translates to “fierce,” meaning fiery or hot, but if you expect to be breathing fire after eating this version, I’m afraid you’ll be disappointed. The cayenne gives it a little bite, but the predominant flavor is delivered by the smoky paprika. If you want to give it a little more fire, you’ll need to add more cayenne to taste. Start a large pot of water on to boil while you preheat the oven to 375 F. When the water comes to a boil, add the diced potatoes. Boil for 5 minutes—no longer or they will start to fall apart. Pour them gently into a colander and allow all the water to drain off. Place the potatoes on a baking sheet that has been lined with parchment paper or a silicone baking mat. Bake for 15 minutes and then stir with a spatula, making sure they aren’t sticking to the pan. Bake for about 20-30 more minutes, stirring again halfway through. The potatoes should become crispy but not hard and overdone. While the potatoes are cooking, make the sauce. Sauté the onion in a non-stick pot for about 3 minutes. Add the garlic, paprika, and cayenne and cook one minute more. Add the remaining ingredients (except parsley) and simmer for about 20 minutes, until thickened. Remove the bay leaf and puree the sauce in a blender or food processor. Return it to the pan and keep warm until ready to serve. Once the potatoes are cooked, place them in a serving bowl and pour the sauce over the top. Sprinkle with parsley and serve as a side dish or appetizer. Dinner tonight — the only change I made is the addition of some soy chorizo. Pure heaven! I absolutely love your site! I am contemplating the path towards becoming vegan but not quite there yet. I am a real veggie lover but find your recipes really inspiring and helpful to someday get me in the vegan direction. Keep posting great recipes, I will continue to make them!! Do you have suggestions for non fat non milk spreads for bread? Not sweet too. Just made this, and its a winner, deffo making it again. You should addend this recipe with a fat-free aioli sauce for dipping. That’s how it’s served in Catalunya. Why are the potatoes boiled first? Can we just bake them? Parboiling the potatoes shortens the baking time and makes sure that they get done without getting dried out. The ingredients list calls for a few drops of oil, but I don’t see where the instructions call for it. Any thoughts? I think originally I had written that you could oil the pan instead of using parchment paper if you wanted.